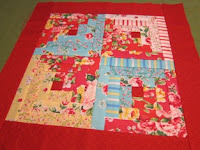 While at the Log Cabin shop, Jacqueline mentioned to us about the jelly roll race gathering at her shop. 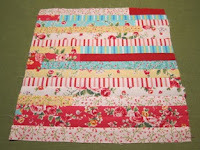 Marijke and I watched the jelly roll race video by Missouri Star Quilt Co. that night, and we decided to try it out with the left over fabrics. 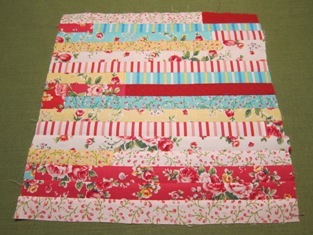 We ended up with another panel, which we weren't sure whether to put it on the back of the log cabin cushion front or use it to make the second cushion. 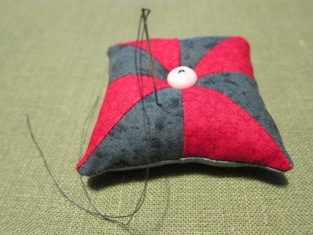 I also had a bit of fun making a little pin cushion for Marijke before making my way back home. 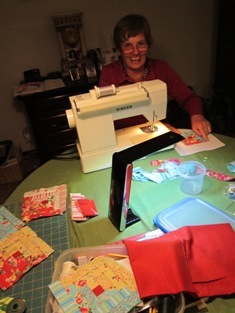 Since I left Maastricht, Marijke has made more patchwork blocks using the (foundation paper piecing by sewing machine) technique. 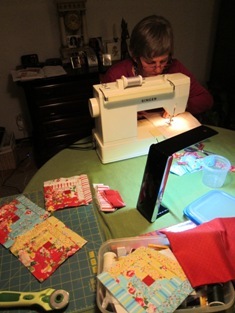 I'm very pleased to hear about (and see) her progress, and not to mention how much I'm proud of my dearest friend.